An audiophile vintage turntable site with e-commerce for an Exeter, NH business. Update 2: A new mobile responsive WordPress Theme was recently developed for this site using the Twitter Bootstrap CSS framework, and HTML5. The conversion process went smoothly and no previous WordPress pages needed to be adapted. This change should lower the client’s bounce rate with mobile devices such as smartphones and tablets. Update: At a later stage, the client wanted to make their site easier to update. The existing HTML site was converted to a WordPress content management system (CMS) in a matter of days. There were 2 immediate benefits to this change. The site could be update without using FTP or hand-coding HTML, and search results, therefore traffic, improved with more friendly page name in the web site’s URLs. 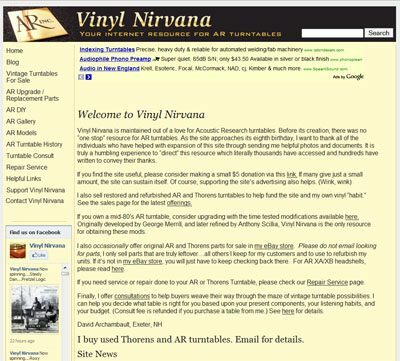 A client based in Exeter, NH wanted to create a simple HTML website for a hobbyist vintage turntable site. They also wanted to receive a lot of traffic in order to sell restored turntables and generate money through ads. An HTML website using a framework based on server side includes was created. This made updates simple on non-redundant. Search engine optimization techniques were applied to the site. This is good example of the client making the extra effort to publish the site’s URL on a great number of sites. This leads to great incoming links, and the cycle continues. This positive feedback loop gives the site a top ten ranking on search engine results pages for targeted keywords. "The quality I most appreciate about Andy as a web designer is his ability to listen. Andy has brought two major ideas of mine to fruition, and in each case, I was amazed at how much he "got right" after just one sitting. I am also very impressed with his willingness to help the customer be self-sufficient in updating his or her website. He takes the time to "train" you, and he is amazingly patient in guiding you along, whether in person or by phone/Skype. Lastly, I LOVE punctuality ... and I could always count on Andy to attend meetings on time, return phone calls at specified times, and most importantly, deliver the project on time"